Attention trainers, the gauntlet has been thrown down! Yes! According to the world’s most accurate Pokemon Go Raid simulator at Pokebattler, if you’ve got some high level, high IV Golems, it is! (Or 6 Mewtwos, but we’re pretty sure that’s impossible right now). You must send us your ORIGINAL video file as an MP4, unedited. It must show the full Ninetales battle from beginning to end in a high-quality, legible format. You must be the exclusive owner of this video and it must be you playing in the battle as the trainer. *UPDATE: For you Youtube influencer/stars, ,we will host the videos EXCLUSIVELY on Pokebattler’s Youtube and article site for 48 hours. Meaning the timer starts after we’ve posted it on our channels. After that you may post it on your own channels but must mention the Pokebattler.com contest in the video via super and audio, and in the comments. You can use free video capture software like DU Recorder for Android. Apparently, you can video capture on iPhone now with iOS 11 but I don’t know how it works. Send video files to [email protected] It’s best to share via Dropbox or Google Drive. 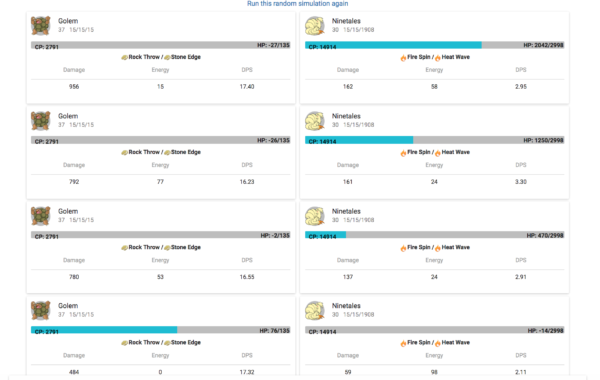 We need the titles, IVs, movesets, and levels of all the Pokemon in the battle to be used for our analysis. Videos not done in English may be translated. It’s up to you if you want your real name displayed or some sort of handle. You will be asked to give a quote about your experience to add to the video and/or blog. We will share up to 3 of your social links or handles with the video post as well. If your mons feint, you may re-enter the battle with new mons. You are not required to catch the Ninetales but you must beat him. 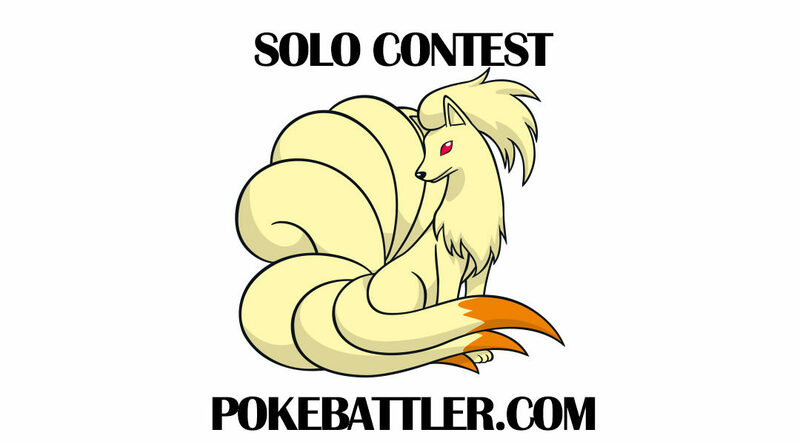 By entering this contest, you give Pokebattler exclusive rights to post your video on our blog, any of our social channels including YouTube, Reddit, Facebook, and Twitter, on any partner site or in advertisements we choose to run. The video will not be monetized through Youtube (aka no ads added to the video in Youtube). If the original video has been found to be posted elsewhere before the 48 hour time limit,or it turns out you are not the sole owner of the video, your entry will become invalid. No cheating will be tolerated. The Pokebox membership winnings cannot be redeemed for cash value. Cash value of winnings is $0.00. Where do we send the video? To record video on iOS 11 go to settings, select Control Centre > Customise Controls, then you’ll see an option for Screen Recording. Press the green + next to the option and you’re done. Next time you want to record video, swipe up to see the Control Centre and you’ll see a symbol of a dot within a circle. Press that once to record the screen. Then swipe up and press the button again to stop. The video will appear in the Photos app. Pokemon faint or lose consciousness, not feint which means to fake an aggressive moment during a fight. This does not quite meet the contest requirements. The video is cut off too early and it needs to be sent to us to post on YouTube. See exclusivity rules. So this means the contest is still on! Celandro, I’ve been studying the successful solo and can’t figure one thing out: he wins with not even a third Golem dying; yet every sim I run on Pokebattler suggests that Golem will die three times, even with perfect dodging! Is this just luck (I certainly know it takes good luck to set a record like this)? 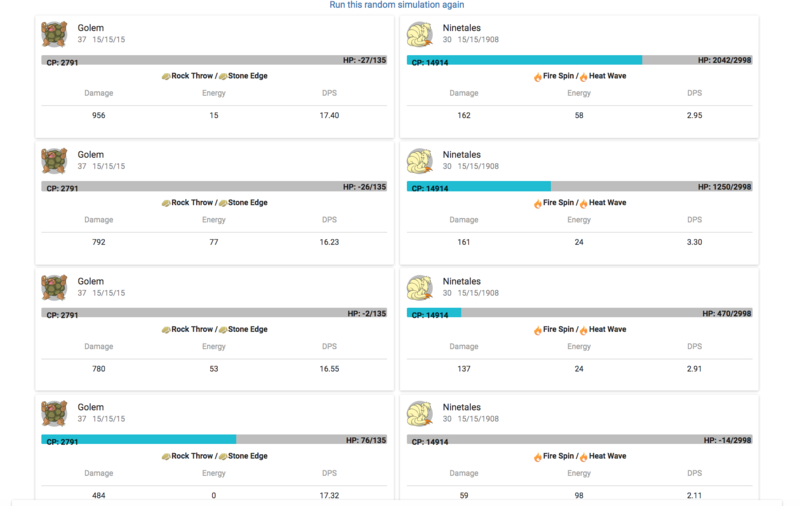 Do you think 2 RT/SE Golems and 2 C/SB Mewtwos would be a better bet? He got very lucky. Make sure you are running random simulations not Monte Carlo for this analysis. I soloed Ninetales 5 days ago :-DD. I now realise that I may be one of the first to do that !!! Unfortunatelly I didn´t know, it was anything special, so I did not record it on video. Level 32 Hydro Pump, level 33 Water Pulse, (about because I now have power them up to attempt to do it again -usuccessfully) and Level 38,5 Hydro Pump with CP3065 . -2 bite hydro pump gyarodos: CP3210 100%IV and CP3174 91%IV. – CP3478 lvl 38,5 93%IV DTDP. I am level 39 I never dodge and I have a gold medal for the gym where I did it (don´t know if it gives any metabonus). Ps: the 6th monster could also have been an omastar my best guess is level 29 CP2018 42%IV Water Gun Ancient Power or CP1822 89%IV mud shot hydropump. And the ORDER may have had an importance.I put often high attack/low stamina first.